some owners, the slow passing of Mexico rural. The estates played a decisive economic and social role in Mexico since emerged in the sixteenth century to its decline in the twentieth. Although almost all born as farmland were transformed and diversified: there were cotton plantations, cocoa, coffee and even pulque. Some grains or sisal exported in large quantities; others are devoted to livestock breeding bulls. There were, of course, mining haciendas. In their backyards, barns, stables and chapels essential episodes of the War of Independence and the Revolution lived. After changing hands many times, of being expropriated, topped and abandoned, many of these farms were rescued late twentieth and early twenty-first to become hotels. Although not all are equally luxurious, they do have something in common: they combine architecture and nature to create different spaces, where there is an air of sensuality. Meet the most beautiful and exclusive twenty of Mexico! $ Less than $ 1,000.$$ From $ 1,000 to $ 1.700.$$$ From $ 1.700 to $ 2.600.$$$$ Than $ 2,600 to $ 3,500.$$$$$ More than $ 3,500. Today it is a pleasure to explore the old part of henequen haciendas of Yucatán, while visiting archaeological and cenotes areas. 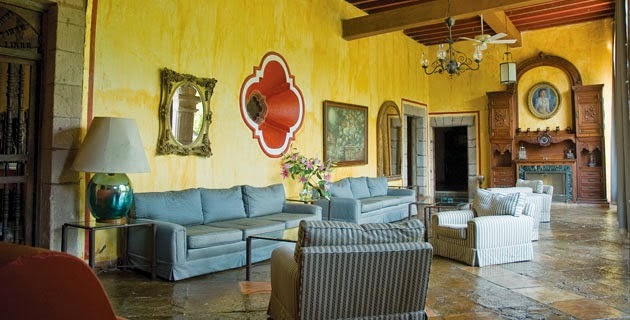 Perhaps the best known hacienda is Temozón Sur, one of the most magnificent in the world, located very close to Uxmal. Smaller but the same hotel group, are Santa Rosa de Lima and San José Cholul. The first, with its melancholy blue facade is in the federal Mérida-Campeche highway, and has around bogs and hillocks where the pink flamingo lives. Meanwhile, San Jose Cholul is a charming, hacienda immersed in the low jungle surrounding Izamal, with rooms with thick walls, Mayan houses with hanging beds and hammocks suspended over the pool. If you want a more hacienda near Merida, a good option is Xcanatún, on the road to progress. It has the distinguished seal of Mexico Boutique Hotels, with 18 suites, an excellent restaurant, terraces and spa. Tip: In Temozón Sur, do not forget to try the best roasted suckling pig on the planet cooked for hours underground. The life of the small colonial settlement that was Alamos changed when its deposits of silver around 1683. Large farms benefit is then built, and the town grew enormously were discovered. But like everything good happens, productive capacity collapsed shortly. After the Revolution, the village was almost abandoned and dilapidated estates. In the late 1980s, an American couple fractions acquired three farms, producing silver and sugar, and became the Hacienda de los Santos, a member of Mexico Boutique Hotels, elaborately decorated with handicrafts and furniture Mexicans. Has a first-rate spa, four pools and a bar with over 500 varieties of tequilas, plus exemplary service by their friendly owners. One of the estates built by Cortés is San Gabriel de las Palmas, which became part of the largest sugar mill in Mexico during the seventeenth century. It is also said that it was the headquarters of Emiliano Zapata during the revolutionary movement in 1910. Today it is a first class hotel with delicious pools. Another alternative in Morelos, slightly cheaper, is the Hacienda de Cortés, provided with a huge aqueduct and founded by all known bearded man. It is said that Cortes was here about 60 120 black slaves and indigenous origin. Today the hotel has colonial sources, an ancient sundial and central courtyard full of flowers.